Based off the 3 year cycle of the white 2000 home jersey the Warriors were allowed to replace their complete range. 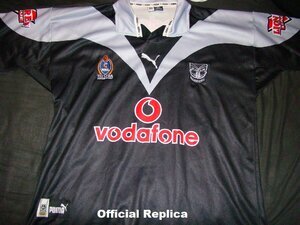 The new home jersey would be black and silver losing all trace of the original home colours. 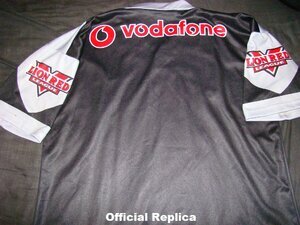 OFFICIAL REPLICA - These jerseys were sold in huge numbers on the back of the teams success in 2002 as well as the public buying into the new look. One of the Warriors most successful jerseys sales wise. Theyre widely available and can go for as little as $40 online right now. REPLICA VARIATIONS - There are fakes out there as well as a line called clean skins which were issued by the NRL without sponsors. 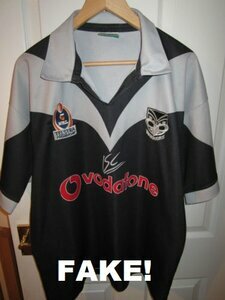 PLAYERS JERSEY - Same as the replica but with a black number and all had a taper around the waist area to a degree. Smaller players had a huge taper.